Forecast: Losing Jay Ajayi will be a tough loss. They do return nine offensive starters including everyone on the line. Who plays at QB won't be out until the first game vs. Washington when Petersen comes back. Toughest MWC will come when they visit Utah State. The Broncos defense will be back to their old ways this season with eight guys back. Tanner Vallejo is the stud at linebacker. Kamalei Correa led the team with 12.0 sacks. Another top 25 year for the Broncos. Forecast: The best linebacking core in the conference and top ten in the nation is in Logan Utah. Nick Vigil and LT Filiaga are studs and first team All-MWC players. My main man Chuckie Keeton is back for one last go. With four linemen back and Hunter Sharp back at WR will be huge. Very tough non-conf schedule with BYU, at Utah and at Washington. 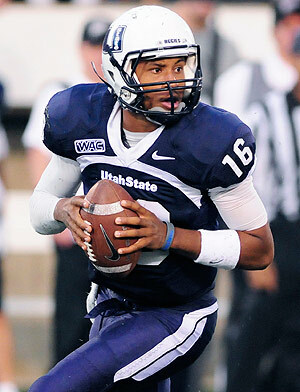 Utah State has the talent to take down Boise and they have the Broncos at home. Forecast: We thought the offense would take a step back last season but they proved that rushing attack ranked sixth in the nation. Jacobi Ownes went over 1,000 yards with only 205 carries. When they do go to the air Jalen Robinette who had 806 yards receiving. Defense is why the Falcons had such a huge year last season and got 10 wins. Only four of those starters but Connor Healy returns at OLB. 10 wins won't happen this year but they could get close. Forecast: Garrett Grayson and Jim McElwain are gone but they do return some talent. Rashard Higgins is that guy at wide receiver with is video game numbers 1,750 yards and 17 touchdowns. The defense was respectable last year only allowing 25.1 points per game. Kevin Pierre-Louis, 85 tackles leads a secondary that has all four starters back. Another team that won't get back to 10 wins but they could come close. They do get home games vs. Utah State, Boise State and San Diego State. Forecast: Bob Davie went all in on the rushing attack and he was pretty successful at it ranking fourth in the land. Jhurell Pressley is their guy at running back after getting over 1,000 yards on just 114 carries! Biggest problem for New Mexico is thier awful defense who didn't stop any one on the ground last year. The six starters and newcomers will try to get this years yards per game total under 500. Forecast: Not too much to like top to bottom for the Cowboys. The defense and offense both ranked in the 100's for scoring and that doesn't seem like it will change this year. Maybe Craig Bohl should have stayed at North Dakota State? Forecast: Maxwell Smith should be a difference maker for the Aztecs. The former Kentucky QB has a limited weapons at wide receiver but has running back Donnel Pumphrey. Pumphrey is one of the top backs in the country after setting a school record with 1,867 yards and 20 touchdowns. Defensively they allowed just under 20 points per game which was second in the MWC. Eight starters are back including Calvin Munson who is the teams returning leader in interceptions, sacks and tackles. Forecast: Nevada is without a known commodity at QB for the first time in awhile. They do however return running back Don Jackson. At wide receiver they have Jerico Richardson back. Richardson had 655 yards last season. On defense they feel good about the front seven and rightfully so with Ian Seau back. Seau had a big year in 2014 with 85 sacks. November games at Fresno State, Utah State and San Diego State will be the tale of this season. Forecast: Still the biggest question in Fresno is the fact that they still don't have a QB they can be 100% confident in. Running back Marteze Waller however needs to stay 100% healthy this season. If they don't have him healthy this season, it could be a down year for the Bulldogs. The defense must improve, they will have depth this season but the quality of that depth is the concern. They went 5-3 last year, this season, expect four wins. Forecast: Here's my sleeper team in the conference! Max Witteck at QB will change everything for the Rainbow Warriors. He has some talented guys to throw to and will finally give Norm Chow the QB he has been waiting for. The first six games for Hawaii might be the toughest in the conference. The defense return six starters, three of them in the secondary are back. Hawaii should put up some points this year so if they can hold opponents around 25 points they could have one of thebest years they have had in awhile. Forecast: Things are very simple for the Runnin' Rebels defense this season. Blake Decker needs to cut back on the turnovers and continue to get the ball to Devonte Boyd. Boyd on just 65 catches had 980 yards. Here's where it gets ugly, the defense gave up 513.5 yards last season. Linebacker is the strength of the team. Where they need to improve the most is on the line. They get UCLA at home week two which is a big deal in Las Vegas. Forecast: Eight starters are back on offense that averaged 19.3 points per game. Running back Tyler Ervin needs to be the focus on offense. San Jose State is bringing in a top recruiting class that should help going into next season. The secondary was the tops in the nation last season at just 117.8 yards per game allowed. In turn they were one of the worst in rushing yards allowed. The line gets thinner and it probably will not improve this year.